If you’re a Digital Nomad then you’re already the envy of all your friends, family and acquaintances. If you’re one of said friends, family or acquaintances then you won’t understand about the long hours, poor internet connections or most importantly trying to get people to understand you have some set work times and can’t just “do it later”. These days being a Digital Nomad isn’t all that uncommon and you’ll find other remote workers in your local cities such as London, in the mountains of Chiang Mai or around the beaches of Bali. One thing we share in common is we all rely on questionable internet access. Questionable in the sense that you can be connecting to different networks each day, in a cafe, library or hotel. You’ve probably already been wondering if that’s wise and if you work with clients considering if their data is safe, let alone your own important business documents or work. Public Wi-Fi is like a huge security hole and to plug this you’ll need a VPN. That’s why I’m rounding up the 5 VPN services that are best for your Digital Nomad usage. Choosing a VPN as a Digital Nomad throws up some interesting questions. While many of the usual considerations apply there are some which are specific to you and how you work. Server Locations – Without question, server locations is the number one consideration as a Digital Nomad. If you work from multiple locations or countries then you need to ensure the VPN service covers these. Choosing a provider that doesn’t offer suitable locations will lead to slow speeds and difficult internet access – and that’s what we’re trying to avoid! Device Limits – The life of a Digital Nomad usually revolves around using a laptop but if you’re anything like me a phone or tablet are never far from your hand to ‘just check emails’. Couple that with a desktop for when you do make it home and you’ll need a VPN service that allows you to use their service on more than 1 device. Speed – Public Wi-Fi often isn’t the fastest at the best of times and if you’re working in more remote locations then your connection can be seriously hampered. The last thing you need is a slow VPN service adding to the issue. Ensuring the VPN service provides top speeds is a must. Services Unblocked – Being a Digital Nomad isn’t all about work. Choosing a provider that unblocks Netflix, BBC iPlayer and other services from home is essential for your downtime. 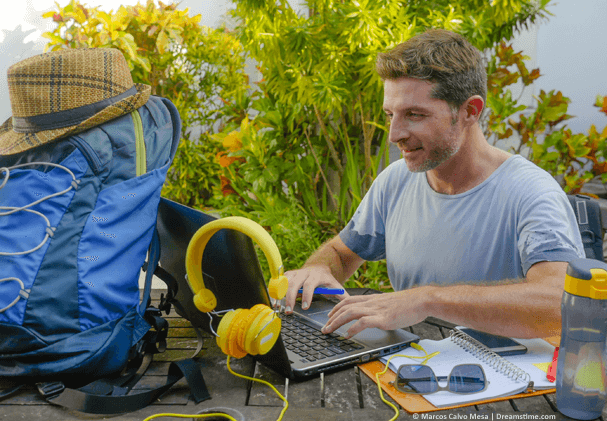 Now you’ve got an idea of a few of the Digital Nomad specific features you should be looking for, let’s take a look at five of the best VPN services for you. ExpressVPN is my go-to choice as a Digital Nomad quite simply because of their array of server locations. Currently boasting servers in over 94 countries it means you’ve got connection points all across the globe. If you’re not on the move so much then many countries have multiple cities available allowing you to get the best protection wherever you are. The service has apps for all major devices so you can protect your laptop, tablet, phone and even your desktop with ease. Plus you can use it on 3 devices at the same time allowing you to keep connected to your online business securely at all times. The VPN works with most of the popular streaming service including American and UK Netflix regions plus a handful more. They’re a VPN that works with BBC iPlayer, Sky Go and others allowing you to relax with your favourite home content in any country. CyberGhost VPN is the champion of making it simple to use a VPN without giving a care about how it works. As a Digital Nomad you already have plenty to be getting on with. If you don’t work in a tech related industry then people shoving abbreviations down your throat of how to stay secure online isn’t a good use of your time. This plucky VPN service has been made for you. Connection is quick and effortless and their apps helpfully point you in the correct direction of where to connect. Without needing to bog yourself down learning about VPN services, CyberGhost VPN lets you lock down your online security and access all kinds of sketchy public Wi-Fi systems while staying protected. They’ve got a 45 day money back guarantee that gives you loads of time to see how they impact your day-to-day work and they’ll work on 7 devices at the same time. IPVanish gets positive reviews across the internet and it’s not without good reason. They’ve been around a long time and built up a good reputation. VPN Servers are available in around 60 countries give or take which gives you plenty of scope for you to connect wherever you find yourself in the world. One of the best features however is the fact they allow you to connect on up to 10 devices. Even if you always like to stay connected you’re unlikely to ever hit this limit. They do only offer a 7-day money back guarantee which is quite short in comparison to others like ExpressVPN and CyberGhost VPN but it should still give you more than enough time to test it from your location. 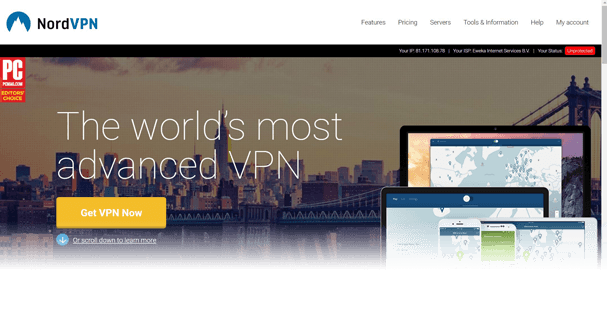 NordVPN has been leading the way as a top VPN service for a number of years now and it comes down to their unique features. If you’re a Digital Nomad working in some regions then you’ll know the importance of protecting your privacy. China, Iran, the UAE and others monitor internet connections and unblocking websites in China can be difficult. Even in more common Digital Nomad locations like Thailand they restrict access to certain websites. The ‘Double VPN’ option from NordVPN stands out because it sends your connection through two different locations giving it an added layer of security. It’s not available on every server location they offer but they do have hubs across the globe. They also have a large 30-day money back guarantee so if you’re travelling through different locations you’ve got plenty of time to see how it performs. Like ExpressVPN, NordVPN works with more streaming services than most. This allows you to unblock and watch US Netflix, iPlayer, NBC, ITV and more. VyprVPN is the best choice if you want to try before you buy. I know that choosing a VPN can be a difficult decision. At last count I noticed over 500 different providers. As Digital Nomads we don’t have time to be wading through them or wasting valuable money on inferior services. That’s why VyprVPN’s free 3-day trial is great if you’re a location independent worker. You do have to pop in some payment details to get the free trial but if you find it’s not for you just cancel and you won’t be charged. They also make a great choice for securing your privacy while working on free Wi-Fi. There are VPN connection points in over 70 locations in some 60 countries. They even have a specific mode if you’re working in China that lets you bust through restrictions allowing you to access social media or other sites you need access to. What VPN is right for your needs? Even though I’ve reduced the huge number of VPN apps to just 5 it can still be difficult to know which one will ultimately be best for your situation. So I’ve put together a list of the right VPN to pick for a variety of situations. These are some of the most common that you’ll encounter as a Digital Nomad. If privacy protection is your main concern, pick ExpressVPN. The service uses a high level of encryption and stores no-logs of what you do while connected. They’re also registered off-shore meaning they’re not restricted by some of the requirements of western governments. If you want to simply connect and go, choose CyberGhost VPN. Their apps are super easy to use plus they’ve got options pointing you in the right direction for specific needs. If you’re travelling across many countries, get ExpressVPN. With VPN servers in 94 countries, they’ve got more connection points than most. If you want to connect multiple devices, select IPVanish. With a 10-device limit, you can connect and protect your entire arsenal of work gadgets. If you want to try before you buy, choose VyprVPN. Their 3-day trial lets you test the service risk free allowing you to see if it’s suitable for your needs. If you want an all-rounder good for everything, opt for ExpressVPN. With plenty of servers, apps for all devices, the ability to unblock TV services and a 30-day money back guarantee you can’t go wrong here. Being a Digital Nomad isn’t easy. You’ve no doubt had countless people envy you and tell you you’re ‘living the dream’. While some of that can be true it isn’t as easy as it seems. Working late, working when sick, never having a base. Us Digital Nomads take the negatives with the positives. Thinking about your online privacy and that of your clients is just another headache. Thankfully one of the five VPN services above will at least take that stress away. If you’re having a hard time choosing then check out the ‘What VPN is right for your needs’ section above. Failing that give my recommended provider for Digital Nomads a try, ExpressVPN. I’ve used them in Australia, Thailand, Bali, America, the UK, France and the Netherlands without issue. They’ve got VPN protection in almost all countries, apps for most major devices and a handy 30-day money back guarantee. You can also get their service 49% cheaper today if you sign up for their annual package because they’re giving you 3-months free. I would love to hear what country you’re working from and which VPN services you’ve found best in your location. Drop me a comment in the section below so we can share road stories! The Ten most popular VPN services – ranked!